Chinese Takeaway - Fusion Cuisine Chinese Restaurant - Thai Restaurant - Japanese Restaurant - Sushi Delivery : Lovely Food Complimented by a lovely View . Best Asian Restaurant Puerto del Carmen - Fusion Cuisine Thai - Japanese - Chinese. Sushi Delivery Puerto del Carmen . Variety of Dishes to Choose from to Dine Out or Takeaway . 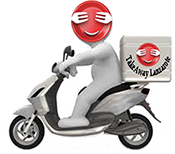 Takeaway Lanzarote - Restaurants Puerto del Carmen Miso Soup Maki-Sushi-Sashimi mixed Tempuras Scallop Lobster Sirloin Steak White Rice or Fried Rice Chocolate Rolls Available on Restaurant Only .